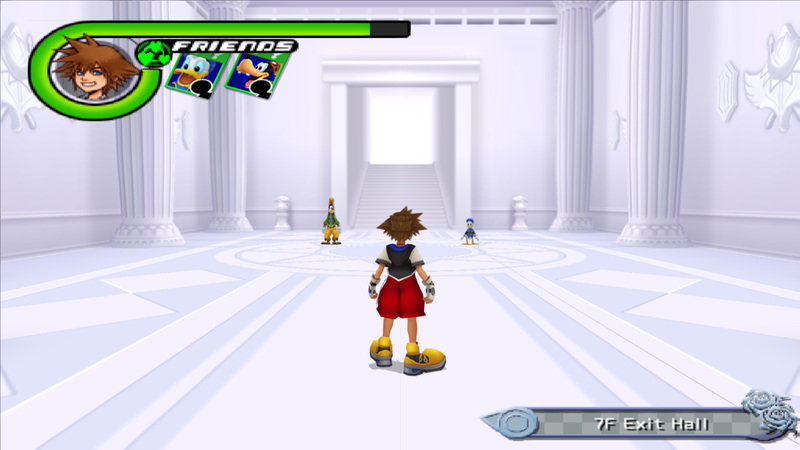 OverviewA 3D PS2 remake of the GBA action RPG Kingdom Hearts: Chain of Memories. Long before Sora was chosen by his Keyblade, the worlds' safety lay in the hands of the true Keyblade Masters. Three youths - Terra, Ventus and Aqua - have been training long and hard under Master Eraqus to prove that they, too, exhibit the Mark of Mastery. But they will soon find themselves in the middle of a crisis affecting worlds far beyond their own - just as another Keyblade Master, Xehanort, goes mysteriously missing. Three friends, three destinies. Everything will link back to the beginning. For the first time ever, Disney films come together in one game, but it's up to you make it their world the happiest place on Earth. 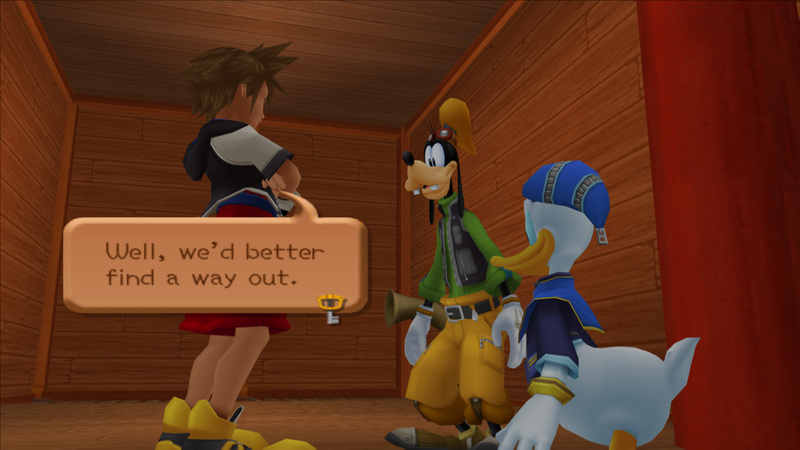 Kingdom Hearts follows Sora in his quest to find his friends and Court Wizard Donald and Captain Goofy as they set out to find the missing King Mickey. The three searchers meet and embark on a magnificent, but dangerous, journey across familiar Disney worlds filled with monsters. Over 100 characters appear in the game including Jafar, Tarzan, and Hercules. Sora, Donald and Goofy travel down a long road that meanders through endless fields, and come to a crossroads. As Sora stands in the crossroads, he gazes up at the night sky and thinks of his lost friends. Just then, a mysterious man approaches from down one of the branching paths. "Ahead lies something you need," he says, "but to claim it, you must lose something dear." The man vanishes before a single path, leading to a castle that eerily resembles a girl's drawing... In the coming journey, what will Sora and his companions gain, and what will they lose? 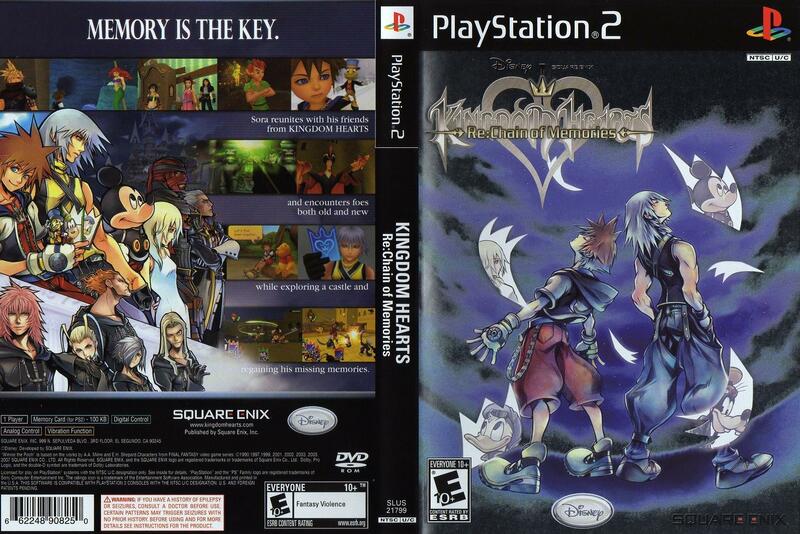 In addition to Sora, players can control Riku in this adventure that bridges the gap between KINGDOM HEARTS and KINGDOM HEARTS II A full 3D remake of the original GBA release, KINGDOM HEARTS Re:Chain of Memories offers a refreshing rendition of the hit title for the PlayStation 2 system. The talented voice cast from the North American releases of KINGDOM HEARTS and KINGDOM HEARTS II, including David Gallagher and Haley Joel Osment, return to breathe new life into the beloved characters. The mini-game catalog has been completely renewed, now with four brand new experiences accompanying the main adventure. 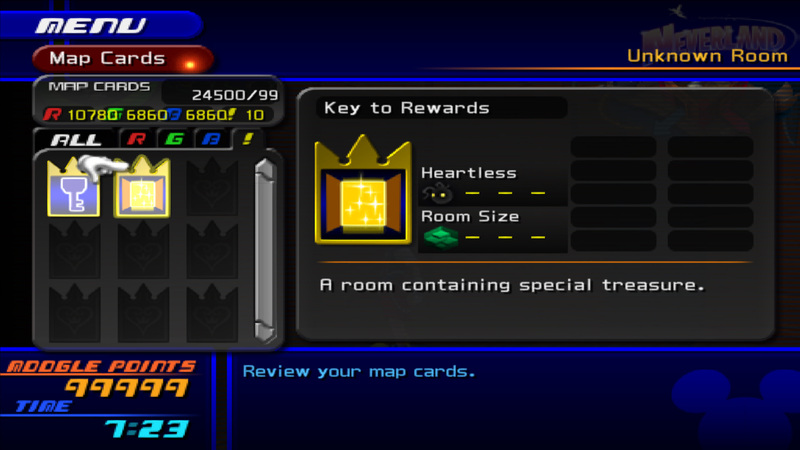 This Kingdom Hearts Storyline summary is necessary and will bring any New Kingdom Hearts Player up to date Kingdom Hearts Birth By Sleep (PSP) Long before Sora was chosen by his Keyblade, the worlds' safety lay in the hands of the true Keyblade Masters. Three youths - Terra, Ventus and Aqua - have been training long and hard under Master Eraqus to prove that they, too, exhibit the Mark of Mastery. But they will soon find themselves in the middle of a crisis affecting worlds far beyond their own - just as another Keyblade Master, Xehanort, goes mysteriously missing. Three friends, three destinies. Everything will link back to the beginning. 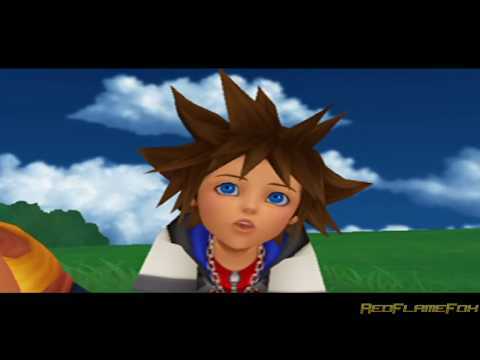 Kingdom Hearts (PS2) For the first time ever, Disney films come together in one game, but it's up to you make it their world the happiest place on Earth. 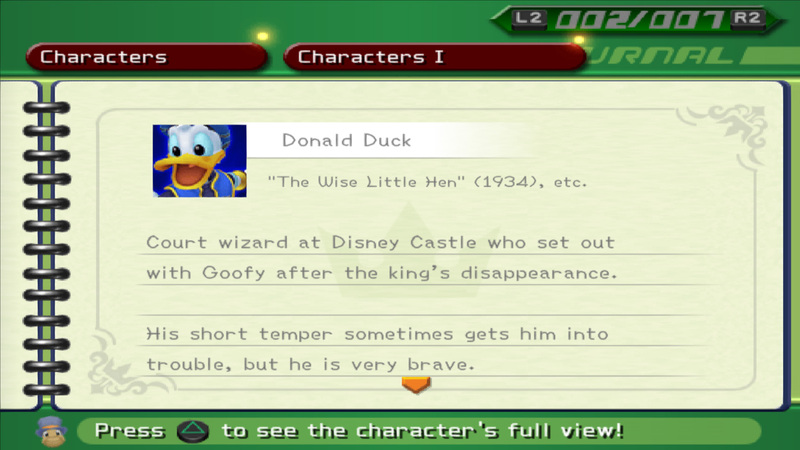 Kingdom Hearts follows Sora in his quest to find his friends and Court Wizard Donald and Captain Goofy as they set out to find the missing King Mickey. The three searchers meet and embark on a magnificent, but dangerous, journey across familiar Disney worlds filled with monsters. Over 100 characters appear in the game including Jafar, Tarzan, and Hercules. Kingdom Hearts Re:Chain of Memories (PS2) Sora, Donald and Goofy travel down a long road that meanders through endless fields, and come to a crossroads. As Sora stands in the crossroads, he gazes up at the night sky and thinks of his lost friends. Just then, a mysterious man approaches from down one of the branching paths. "Ahead lies something you need," he says, "but to claim it, you must lose something dear." The man vanishes before a single path, leading to a castle that eerily resembles a girl's drawing... In the coming journey, what will Sora and his companions gain, and what will they lose? In addition to Sora, players can control Riku in this adventure that bridges the gap between KINGDOM HEARTS and KINGDOM HEARTS II A full 3D remake of the original GBA release, KINGDOM HEARTS Re:Chain of Memories offers a refreshing rendition of the hit title for the PlayStation 2 system. The talented voice cast from the North American releases of KINGDOM HEARTS and KINGDOM HEARTS II, including David Gallagher and Haley Joel Osment, return to breathe new life into the beloved characters. The mini-game catalog has been completely renewed, now with four brand new experiences accompanying the main adventure. 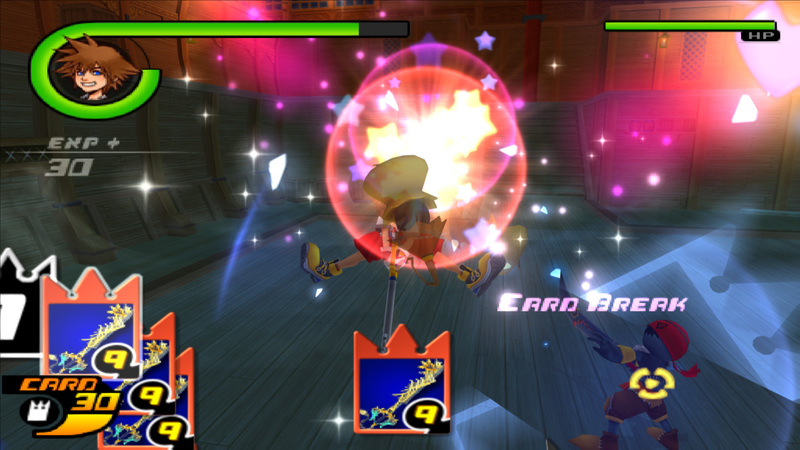 Kingdom Hearts: Chain of Memories is a remake of the GBA game of the same name. 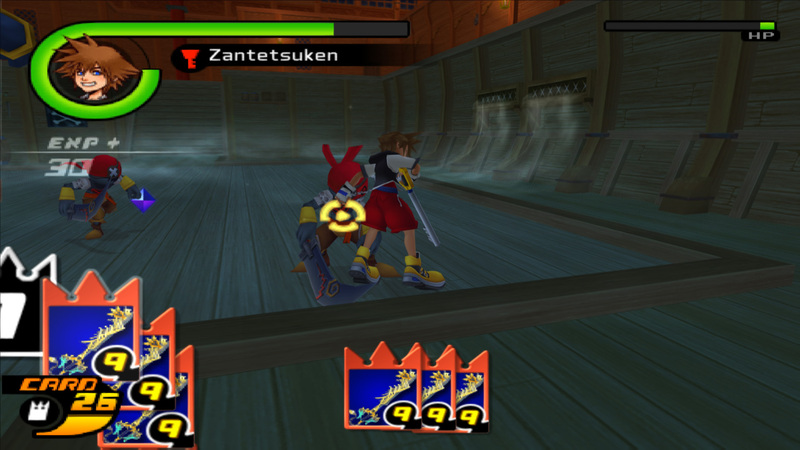 While KH: CoM uses a real-time battle system, this time there is a card system in place. You must utilize these cards to your advantage. This KH takes place after the first KH. You play as two different stories following Sora and Riku. While the battle system is a little different, it is still a good game. Any KH fan should enjoy this one. Now you can add videos, screenshots, or other images (cover scans, disc scans, etc.) for Kingdom Hearts - Re-Chain of Memories (USA) to Emuparadise. Do it now!